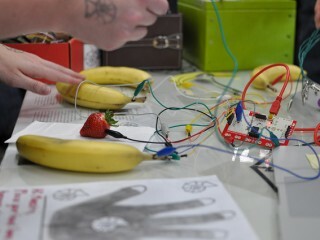 Makey Makey is an electronic invention kit that lets users connect everyday objects to computer programs. Using a circuit board, alligator clips, and a USB cable, the system uses closed loop electrical signals to send the computer either a keyboard stroke or mouse click signal. This function allows the Makey Makey to work with any computer program or web page that take input. In this example, students will work together to make a human presentation slider using a Makey Makey. Promote exploration and creativity with this Makey Makey lesson. Your students will discover how to create their own video game controller and then write an informational how-to guide to share with other classes/schools to encourage the Maker Movement. Can be adapted for any grade level! The Maker Movement is making headway in education. Long gone are the days where the teacher prescribes a certain formula and the students turn out a rote product. By checking out this make, you will be going to a blog post of mine that takes you through 4 lesson plans that will help you effectively introduce Scratch to your class and will show you how to create a simple Scratch game. My final product is to play Scratch with a MaKey MaKey kit, but that is not imperative to the final product. This work by Angelique with Karen Fasimpaur is licensed under a Creative Commons Attribution 4.0 International License.